UPDATE: Show's about to go live; watch it here. Just a friendly heads up: at 2pm PST tomorrow, Capcom Unity will host a live playthrough of Mega Man 4. Of course, what's a good stream without some sort of giveaway? The Unity crew will be giving out prizes throughout the show, such as GE Animation's ridiculously awesome plush Mega Buster! Former Mega Man Legends 3 Devroom liaison GregaMan is spearheading the initiative... but is he up to the task? GregaMan openly admits Mega Man 4 might be a toughie, so be sure to hop aboard the live chat and help him out when the time comes. 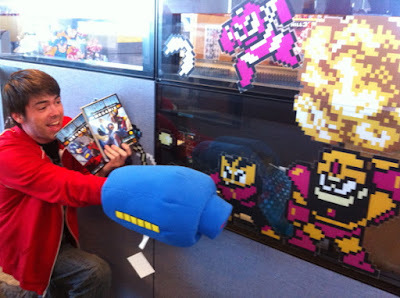 For further details, check out this post at Capcom Unity. If it's tomorrow, what is today? today is the 19th, depending on your time zone. Or be prepared to torment him by putting his skills on blast! In a teasing way of course. Something tells me most of the comments are going to be: Bring back Legends 3! A livestream of Mega Man 4, huh? Interesting. Honestly, I'm quite surprised it wasn't Mega Man 2. It's about time other games in the series are getting this recognition. I forgot and missed it. These things are only fun when they are live. Oh well, there is next months playthrough of mm5.